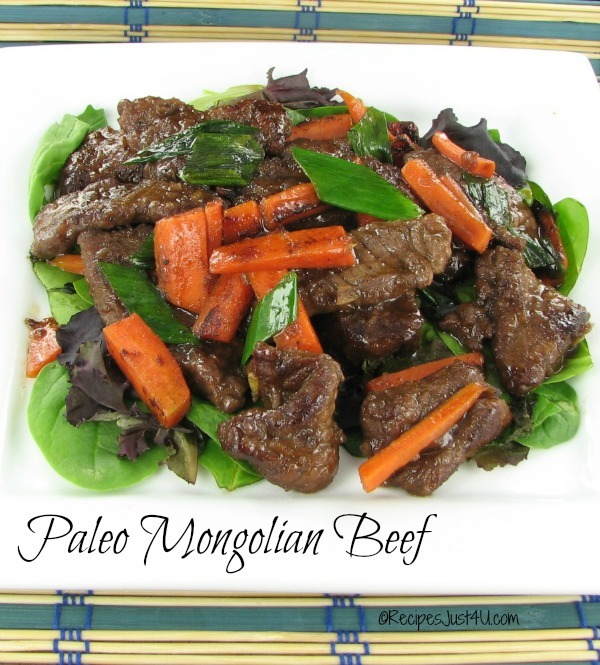 If you follow a Paleo diet and like Asian foods, this Paleo Mongolian Beef recipe is the perfect choice. It features thin strips of beef in a deliciously tasty sauce that will become an often cooked recipe and one of your family’s favorites. Best of all? It’s one of my 30 minute meals! My sister and her husband recently changed to a Paleo diet because her husband suffers from rheumatoid arthritis. They got very good results from it and lost a significant amount of weight. Basically, with a Paleo diet, you choose mainly raw, unprocessed foods and stay away from sugar. Choosing these foods means that you automatically eliminate a whole range of preservatives, hidden sugars, additives, coloring agents, and artificial flavors found in so much of the processed food. The recipe is easy to make. 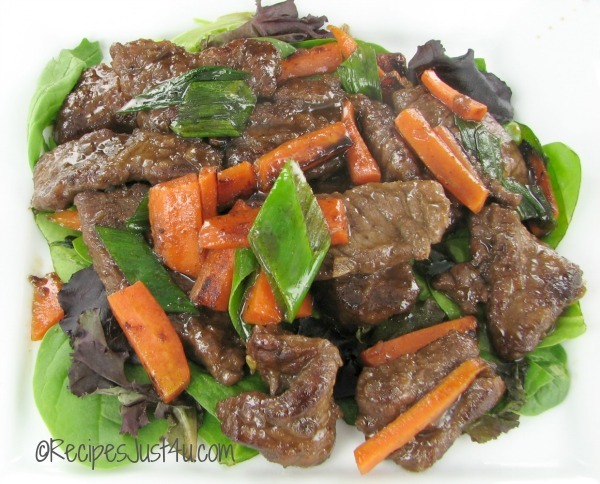 Basically, you make the sauce first and then cook the carrots and beef and combine. 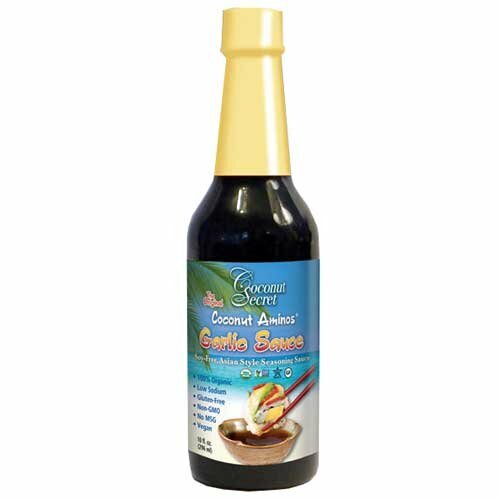 The main ingredient that you may not have on hand is coconut aminos, a Paleo substitute for soy sauce. The recipe has a bit of spice from the red peppers and the raw honey cuts that to make it a really tasty sauce. Since rice is a no no with Paleo diets, serve this over julienned zucchini strips or a bed of sweet potatoes. Cut the steak against the grain and thinly slice the carrots. Mix together the arrowroot, pepper, and sea salt. Place in a bag and combine the beef with this mixture. Lay the coated steak on a rack and let it sit for 10 minutes or so. The powder will coat better. Make your sauce by heating 1 tbsp of olive oil in a medium saucepan over a medium heat. Add the ginger, garlic and red pepper flakes and cook for about 1 minute. Add the sesame oil and beef broth, then the raw honey, garam marsala, and coconut amiinos, mix well to combine, stirring frequently. 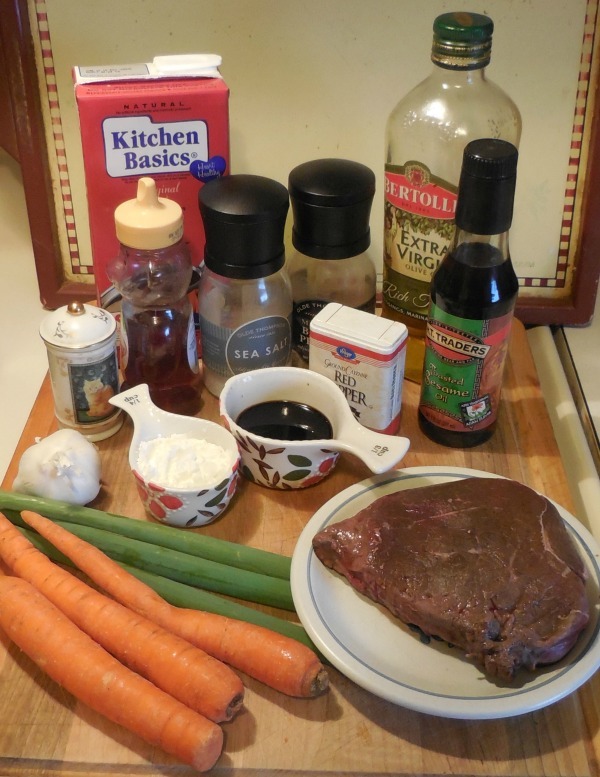 Add your remaining tablespoon of oil and cook the beef and carrots over a medium high heat until the beef is browned and the carrots are al dente. (about 3-4 minutes). Remove and drain the excess oil. Add the beef and carrots back to the pan. Cook for 1 minute and add the sauce. Combine and heat for about 3 minutes. Add the spring onions and cook an additional minute. Serve over julienned zucchini strips or pieces of sweet potatoes. Recipe adapted from a similar one on Paleo Cupboard.